When I opened my front door this week to see one of my favorite sights resting up against the door I was tickled pink. 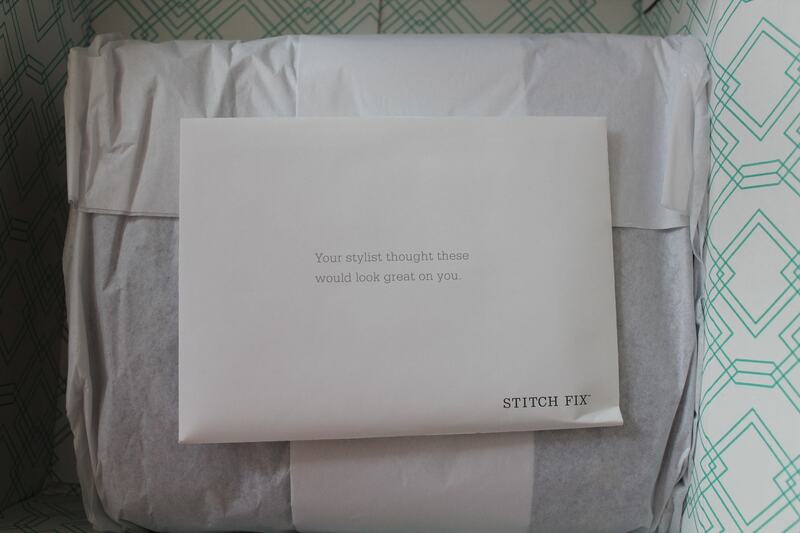 I found Stitch Fix through someone I follow on Twitter and have been enjoying the occasional Fix ever since. (Side note: Did you know that 67% of women say they would rather get information from an experienced mom like themselves compared to a celebrity mom. I love that we can count on each other.) 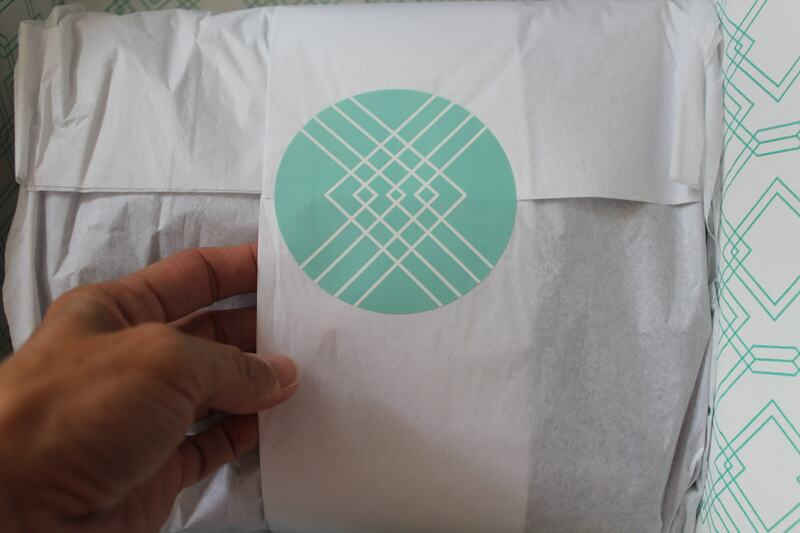 Stitch Fix is a clothing service that sends a box of hand selected clothes to your door as often as you’d like…let’s open the box! So this was the first little gem I pulled out. As I’m going through my box, I like to take my time and not get judgmental about pieces at first glance. I like the color of this and the studs…if there were less of them. I love the lace detail and it’s completely on trend right now. I love the fact that it’s two of my favorite neutral colors…did you know that gray is the new black? And you thought it was orange. It has the boxy shape and longer length that will hide the belly/buns and allow me to rock my arms and legs…work ’em if you got ’em. So you know these are my favorite neutrals which would look great popped with a colored shirt underneath or colored denim on the bottom. It also will camouflage the middle third of the body. I struggle with the long front pieces of sweaters like these however. This piece is on the fence for me. I’m sure you have the same struggle I do with finding pants that fit…so discouraging. The color on these is quite fun and they actually fit me…WINNING! This is the second pair of pants I’ve kept from a Fix. They have my heart forever for that fact alone. And last but not least is this little beauty…it’s like a recipe card for clothes. YAH! Typically the card shows a casual outfit suggestion and then one that is more dressed up for each piece. Who couldn’t use a little help when putting things together? How do I sign up? You can click through HERE to sign up. (Disclaimer: Besides signing up with that link, I’ll be receiving a $25 referral credit.) You will fill in some general information and also a style profile. This not only helps them determine what style you are but it will help you too! The information on the profile is how they know what kinds of clothing and accessories to send you. What does it cost? The cost per fix is $20. That includes them selecting the items, shipping them to you and return shipping for the pieces you don’t want. That $20 also comes off the price of anything you buy. Example: You keep a $40 blouse. It ends up costing you $20 because the $20 you paid for the Fix has been applied to the price. Is the clothing expensive? You won’t find Target prices in your Fixes but you can give them price guidelines. I have set top and bottom price points for what I will spend on different types of items. The average price of the pieces they send is $50-$65. How do I return what I don’t want? Inside the box is a large plastic envelope with a prepaid return label. You put the items you don’t want inside, seal it shut and mail it off. How I do purchase what I want to keep? You have 3 days to go online and checkout. Once you’ve done that, you need to get those pieces you are returning in the mail ASAP. When you are checking out, you will be able to leave responses on each piece as to what you liked or didn’t like. The more information they have, the better your boxes will be. Am I committed to anything? NO. You can get a Fix as often or seldom as you like. You can also include notes through the website about what you want very specifically. If you have a work event coming up and need a dress, you could ask just for dresses appropriate to that event. How many items do you keep? Typically, I keep at least one item per box. This was my 6th box and I recall sending everything back only one time. In the blog I will link below, she writes that they expect you to keep 1-2 pieces per box although there is an additional 25% discount when you keep all of the items. If you’d like more detailed information on Stitch Fix you can go use the link above to go to the website. Additionally, HERE is another blog post about how Haylie at The Tiny Twig uses Stitch Fix.